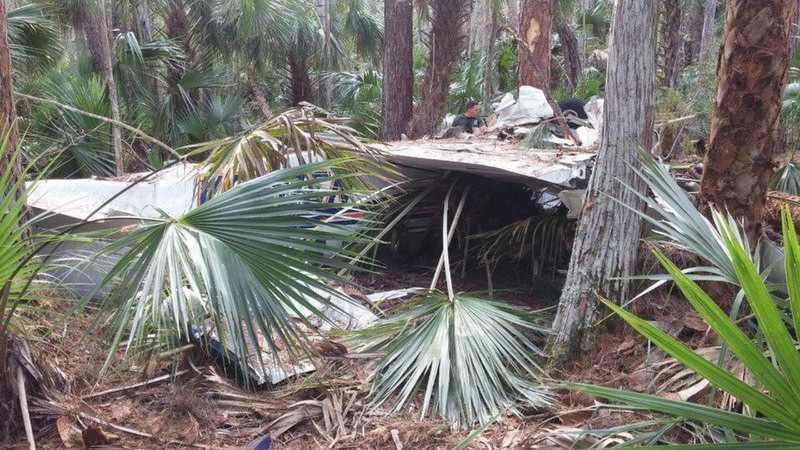 On November 9, 2016, at 0913 eastern standard time, an experimental amateur-built Challenger-II, N327SH, was destroyed during an in-flight breakup in Crescent City, Florida. The flight instructor and student pilot/owner were fatally injured. Visual meteorological conditions prevailed, and no flight plan was filed for the local instructional flight, which departed Skinners Wholesale Nursery Airport (16FD), Crescent City, Florida, about 0815. The airplane was privately owned and operated, and the flight was conducted under the provisions of 14 Code of Federal Regulations Part 91. 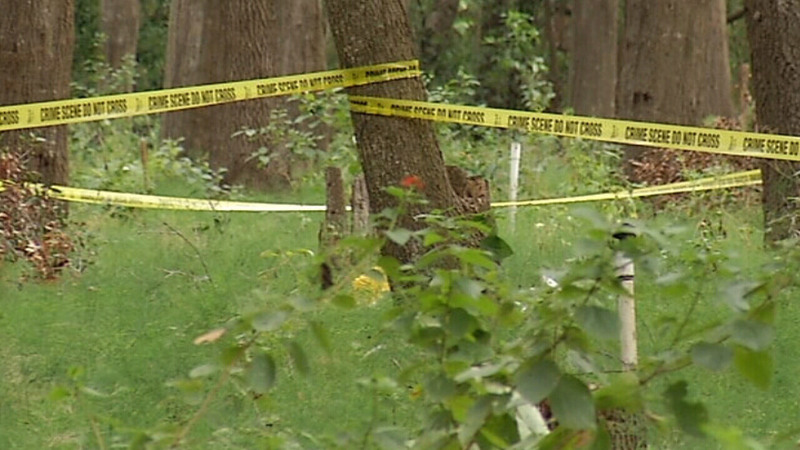 A witness stated that while outside in his front yard, he observed the airplane flying towards him on a southerly heading, above the trees on his neighbor's property. The engine noise decreased to what sounded like idle, and the airplane began to descend, "as if it were gliding." A few seconds later, the airplane pitched up sharply, and the engine noise became much louder, "as if it were trying to go up." He then heard a loud sound, and observed a wing separate from the fuselage. 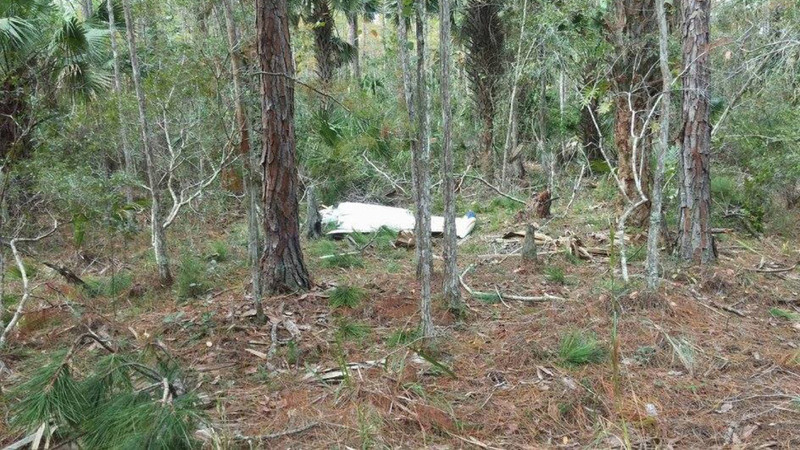 The fuselage then turned and went straight down into the woods below, which was about 1,000 feet north of the witness's location. The wing continued in the air briefly toward the south. The witness stopped looking for a moment and moved toward some shelter. When he looked up, the [right] wing was in his front yard next to his house, about 30 feet away from him. Another witness who was located outside in the woods, about 500 feet east of the accident site, first observed the airplane flying overhead, "way above the trees," with the engine running. He then noticed that a parachute was trailing behind the airplane, uninflated, as it descended into the trees and impacted the ground. He said there was no explosion, no fire, and he did not see anything fall from the airplane. 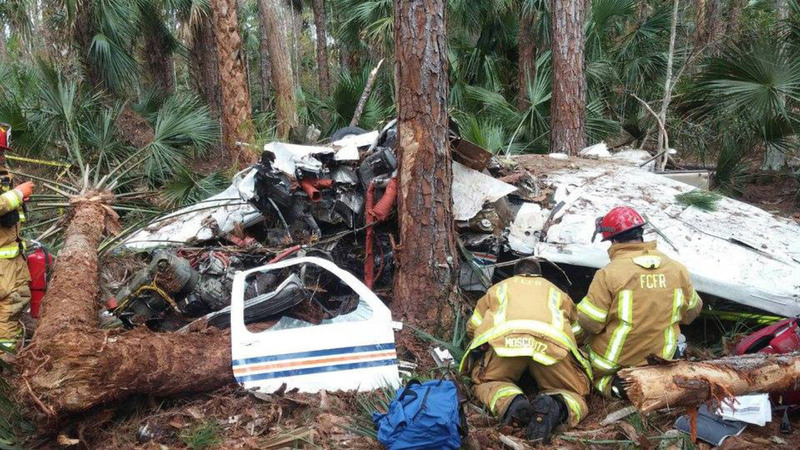 According to a friend, the owner purchased the airplane about 3 weeks prior to the accident. He had flown with the flight instructor in the accident airplane at least twice. He considered flying to be a hobby; he had flown regularly with the flight instructor and received dual instruction; however, he did not intend to earn a pilot certificate. The friend stated that about 1 week before the accident, the owner and the flight instructor experienced a "very hard" landing, after which, the main landing gear were "splayed out." A steel cable that ran between the landing gear under the fuselage, had broken. The owner had purchased a replacement cable and performed the repair himself 2 days prior to the accident. The friend indicated that that the owner had previously been an airplane mechanic in the U.S. Navy. The main wreckage came to rest in a wooded area in the vicinity of 29.408056 degrees north latitude, 81.514444 degrees west longitude. The majority of the airplane was severely fragmented with the major components found separated from the fuselage and damaged. Portions of the left wing came to rest in a tree about 30 feet high. The right wing was found largely intact about 1,000 feet south of the main wreckage. Wing fabric fragments and wing strut fairing fragments were strewn throughout a neighborhood south of the right wing location. 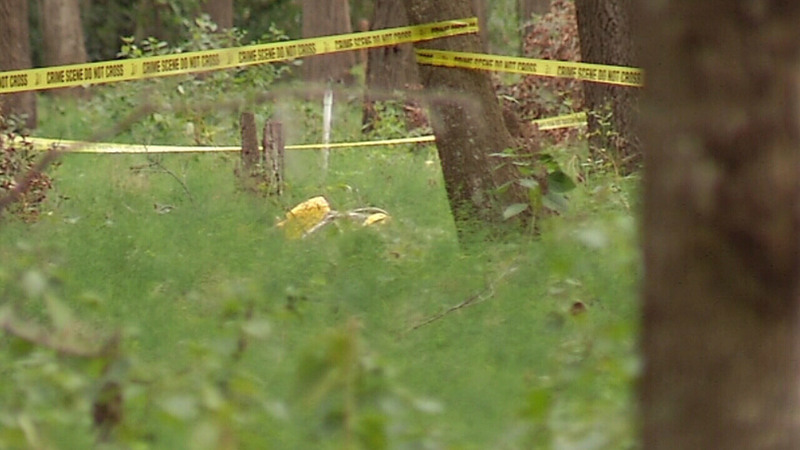 The airframe parachute was found opened and with the main wreckage, the expended rocket motor and parachute sleeve were found in a tree about 600 feet southeast of the main wreckage. The airplane was recovered to a salvage facility for further examination. All major components and flight control surfaces were identified. Flight control continuity could not be confirmed due to the extent of the impact damage. The two right wing struts (forward and aft) were fractured about mid-span, the ends of each remained attached to the fuselage and the right wing. The two right wing attach brackets, located on a centerline aluminum square beam at the top of the fuselage, were fractured and separated from the beam. A portion of the forward bracket was not found. The beam was fractured at the aft bracket location. The two cylinder, two-stroke engine sustained impact damage and the two propeller blades were both fracture separated about 10 inches from the root. The engine was rotated by hand with some binding. An accessory pulley was damaged and impinging on the engine case. Both pistons moved as the engine was rotated, as observed through the intake manifolds. The two carburetors remained together as a unit with the air filter, separated from the engine. One carburetor's float bowl was separated and missing and the main jet housing was fractured with the jet missing. The other carburetor's bowl was removed; the floats were intact and the bowl was dry. A small amount of liquid consistent with the color of automobile gasoline was present in the inline fuel filter. One spark plug was fractured and could not be removed. The remaining three sparkplugs were removed; all electrodes were intact, and each exhibited tan and black coloration. According to the airplane's maintenance records, the most recent condition inspection was performed on June 14, 2016, at which time the airplane had accrued a total of 124 flight hours. The airplane had flown about 18 hours since that inspection. Remnants from the right wing, its attachment fittings, a portion of the square centerline beam, and a recovered damaged circuit card from a handheld GPS unit, were forwarded to the NTSB laboratory, Washington, DC, for further examination. CRESCENT CITY, Fla. - Two men were killed Wednesday morning when a small plane crashed in a remote area south of , according to the Putnam County Sheriff's Office. 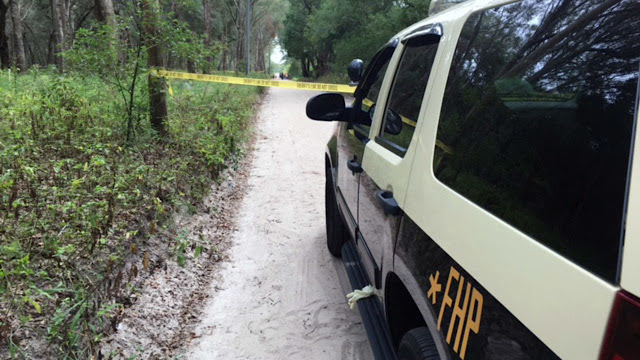 The crash was reported just before 9:30 a.m. on the property of a fern farm near U.S. 17 and Smiley Store Road. 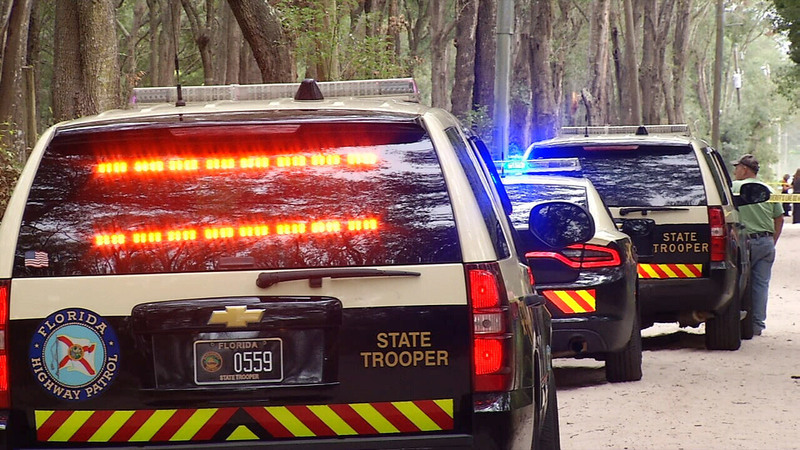 Florida Highway Patrol troopers have identified the men as Thomas E. Stevens, 67, of Crescent City and Joe Anthony Fyock of Orange City. People who knew Stevens said he was taking off from his farm about a mile away from the crash site when they heard a loud explosion and came running. They said he was taking a joyride in the plane, which was an ultralight experimental aircraft. 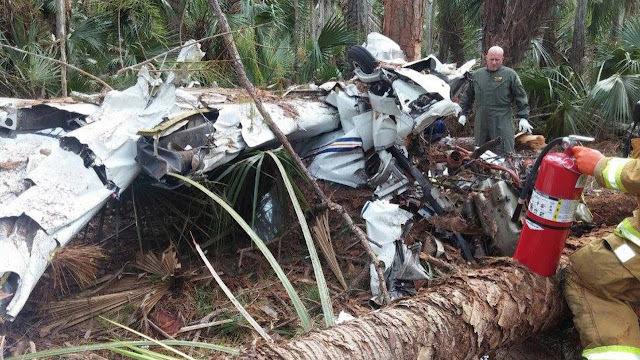 According to the FHP report, "for reasons still under investigation, the aircraft quickly lost altitude and struck the trees and ground below." Stevens was flying the plane and Fyock was his passenger. The FHP is leading the investigation. 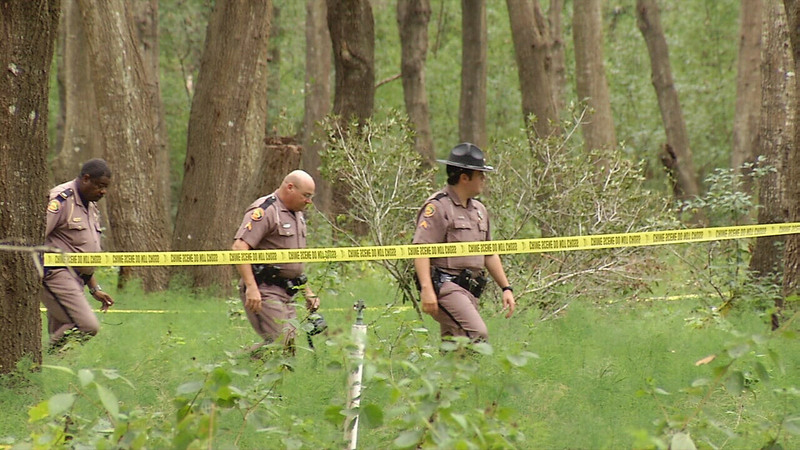 "We are getting some information with witnesses and local residents about what possibly happened with this, so we're taking all that information and seeing if we can figure out what happened in this terrible tragedy," FHP Master Sgt. Dylan Bryan said. The Federal Aviation Administration and the National Transportation Safety Board have been notified and will be investigating. 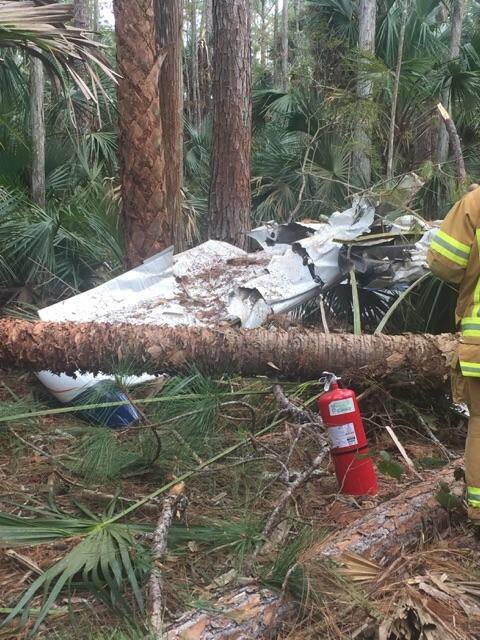 FLAGLER COUNTY, Fla. - Flagler County Fire Rescue was at the scene Wednesday of a small plane crash on the western outskirts of Plantation Bay. 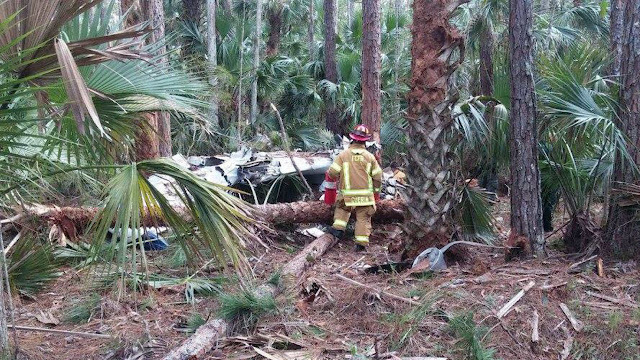 The plane was a 1969 Beechcraft Bonanza 36, officials said. 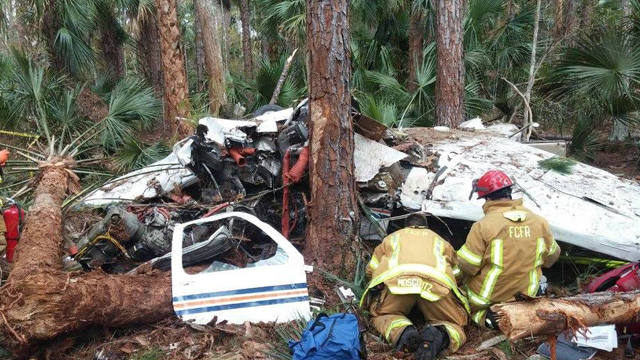 Two men had taken off from the Flagler County Executive Airport and were on the way to DeLand when the crash happened. The pilot of the plane called the Flagler County Sheriff’s Office and dispatchers were able to use his phone’s GPS coordinates to guide first-responders to the scene. An initial call came at 1:28 p.m. from someone playing golf at Plantation Bay who said she saw the plane go down. "One patient has multiple broken bones, and we have not been able to assess the injuries of the second patient," Flagler County Fire Rescue Chief Don Petito said. 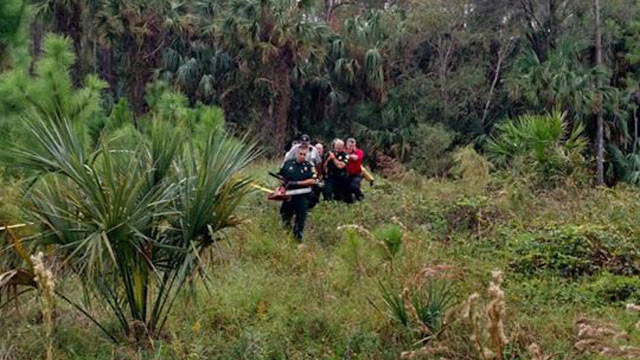 One of the men had to be cut out of the plane, while the other was thrown into the woods, officials said. “The second patient was still trapped inside the plane and crews had to extricate that second patient from the airplane and then extricate him out of the woods,” said Petito. 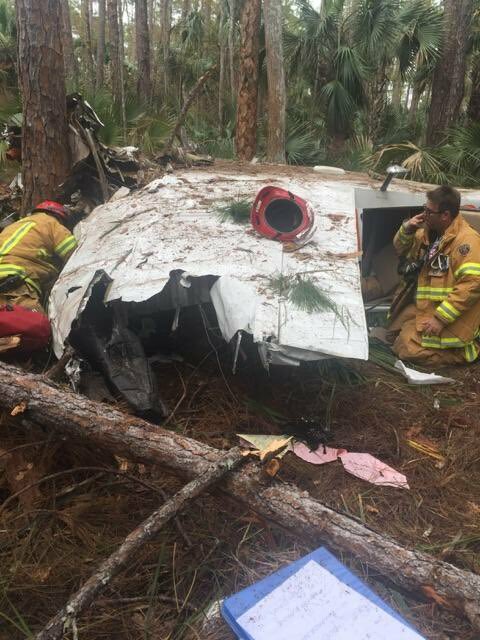 Joel Fallon and Josh Rosa both of Palm Coast, were pulled out of the plane’s wreckage and flown by helicopter to Halifax Health Medical Center in Daytona Beach with serious injuries. Investigators from the Federal Aviation Administration and National Transportation Safety Board have been notified and will be investigating. The flight was en route to Ormond Beach, Florida, when he reported a main landing gear indication problem. The pilot diverted to Daytona Beach Airport for a precautionary landing. During a visual check of the landing gear by the emergency vehicle operators, it was reported that the landing gear appeared to have been down. The pilot also reported that throughout the entire sequence of events, the landing gear indicator lights' intensity continued to vary from light to dim conditions. The pilot said he made a soft field landing on runway 7 and held the nose wheel off the runway. When the nose wheel touched the pavement, the main gear, and the nose gear collapsed. The examination of the landing gear system failed to disclose a mechanical malfunction or a component failure. The collapse of the main landing gear for undetermined reasons. On November 13, 1999, at 2112 eastern standard time, a Beech BE36, N3089A, experienced a right and left main gear and nose gear collapse on landing rollout at Daytona Beach Airport, in Daytona Beach, Florida. The personal flight was operated by the commercial pilot under the provisions of Title 14 CFR Part 91, and instrument flight rules. Visual meteorological conditions prevailed at the time of the accident and an instrument flight plan was filed. The airplane sustained substantial damage and the pilot and passenger were not injured. The flight departed Tallahassee, Florida, at 1915. According to the FAA, the pilot was en route to Ormond Beach, Florida, when he reported a main landing gear indication problem. The pilot diverted to Daytona Beach Airport for a precautionary landing. During a visual check of the landing gear by the emergency vehicles operators, it was reported that the landing gear appeared to have been down. Throughout the entire sequence of events, the pilot reported that the landing gear indicator lights' intensity continued to vary from bright to dim. The pilot said he made a soft field landing on runway 7L and held the nose wheel off the runway. When the nose wheel touched down on the runway pavement, the main gear and the nose gear collapsed. Examination of the wreckage revealed damage to the propeller, gear doors, and the left and right wing inboard ribs. A post-accident examination of the airplane and the landing gear system was conducted. The examination of the landing gear system failed to disclose a mechanical malfunction or a component failure. Registered Owner: Blanco Leasing Inc. The student pilot reported that, during his third solo flight, he “had a hard landing.” He added that he aborted the landing, landed again, and taxied to the ramp without further incident. After shutting the airplane down, he noticed that the propeller and nose landing gear were damaged. The student pilot’s improper landing flare, which resulted in a hard landing. The pilot reported that during takeoff on a dirt runway he rotated the airplane and as it "went through a dip in the airstrip" he felt a "thump" [tail strike]. The pilot further reported that the airplane became airborne and he continued the flight uneventfully. During a postflight inspection, it was revealed that the airplane sustained substantial damage to the bulkhead and lower skin of the tail cone. The airplane's encounter with a depression in a dirt runway during takeoff, which resulted in a tail strike. The private pilot had recently purchased the airplane; he and a flight instructor were conducting a local familiarization flight. After about 1 hour of flying with the left inboard fuel tank selected, he returned to the airport traffic pattern and performed two additional takeoffs. While on the left downwind leg of the traffic pattern, the engine experienced a total loss of power. The pilot checked that the fuel pump was on while the flight instructor attempted to determine why the engine lost power. The flight instructor then took control of the airplane and turned toward the runway. The airplane contacted the tops of some trees and landed on uneven terrain covered with tall grass and brush about 500 ft short of the runway, which resulted in substantial damage to the firewall, fuselage, and wings. Before exiting the airplane, the pilot moved the fuel selector to the "off" position. A Federal Aviation Administration inspector examined the wreckage and found that the left inboard fuel tank was absent of fuel, while the right inboard fuel tank was full. The pilot reported no preimpact mechanical malfunctions or failures with the airplane that would have precluded normal operation. When asked how the accident could have been prevented, the pilot stated, "switched to the other fuel tank." A total loss of engine power due to fuel starvation, which resulted from the pilot's mismanagement of the available fuel. The private pilot had recently purchased the airplane; he and a flight instructor were conducting a local familiarization flight. After about one hour of flying with the left inboard fuel tank selected, he returned to the airport traffic pattern and performed two additional takeoffs. While on the left downwind leg of the traffic pattern, the engine experienced a total loss of power. The pilot checked that the fuel pump was on while the flight instructor attempted to determine why the engine lost power. The flight instructor then took control of the airplane and turned towards the runway. 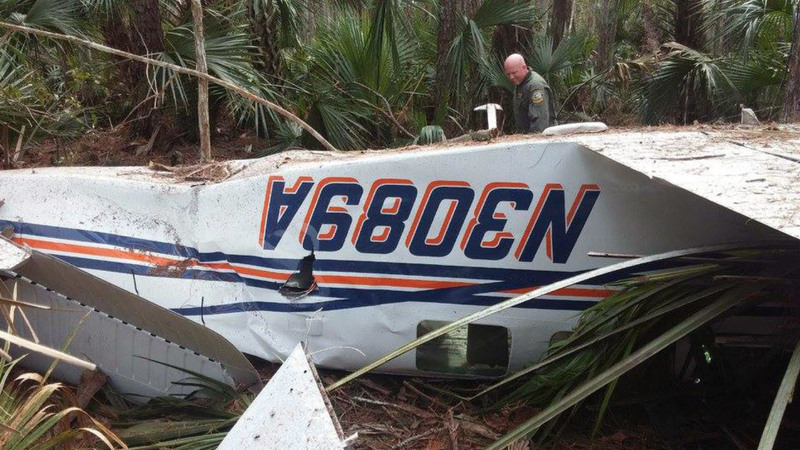 The airplane contacted the tops of some trees and landed on uneven terrain covered with tall grass and brush about 500 feet short of the runway, resulting in substantial damage to the firewall, fuselage, and wings. Before exiting the airplane, the pilot moved the fuel selector to the off position. A Federal Aviation Administration inspector examined the wreckage and found that the left inboard fuel tank was absent of fuel, while the right inboard fuel tank was full. The pilot reported no preimpact mechanical malfunctions or failures with the airplane that would have precluded normal operation. When asked how the accident could have been prevented, the pilot stated, "switched to the other fuel tank." The pilot of a tailwheel-equipped airplane reported that, during the landing roll after his fifth landing, the airplane veered hard left. He corrected to the right, but as the airplane straightened out, the left main landing gear impacted a runway light, spinning the airplane around. Subsequently, the left main landing gear collapsed, and the airplane came to rest on the left side. The pilot reported that there were no preaccident mechanical malfunctions or failures with the airplane that would have precluded normal operation. The pilot further reported that he received his tailwheel endorsement 3 months before the accident. The pilot’s failure to maintain directional control during the landing roll. The pilot of a tailwheel-equipped airplane reported that during the landing roll after his fifth landing, the airplane veered hard left. He further reported that he corrected to the right, but as the airplane straightened out, the left main landing gear impacted a runway light, spinning the airplane around. Subsequently, the left main landing gear collapsed and the airplane came to rest on the left side. The pilot further reported that he received his tailwheel endorsement 3 months prior to the accident. AIRCRAFT ON APPROACH SUSTAINED A BIRD STRIKE, LANDED WITHOUT INCIDENT, ROCHESTER, MINNESOTA. On November 8, 2016, about 1415 eastern standard time, a Cessna 177B, N30703, was substantially damaged during a forced landing near Hopkinton, Rhode Island. The private pilot was not injured. No flight plan was filed for the flight that originated at Windham Airport (IJD), Willimantic, Connecticut, destined for Richmond Airport (08R), West Kingston, Rhode Island. Visual meteorological conditions prevailed for the personal flight conducted under the provisions of 14 Code of Federal Regulations Part 91. After a normal preflight inspection, the pilot departed towards the southwest for the 28 nautical mile flight to 08R. During cruise flight about 7 nautical miles from the destination airport, the engine suddenly lost all power. The pilot attempted to restart the engine but was unsuccessful. From an altitude of 1,800 feet mean sea level, the pilot selected a field and executed a forced landing. 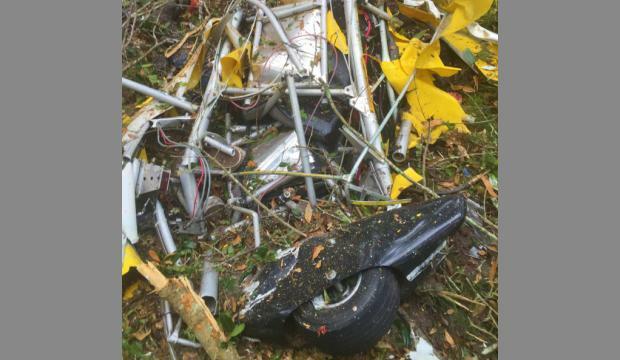 During the landing roll, the airplane impacted two small trees before it came to rest, which resulted in substantial damage to the wings and the fuselage. The pilot stated that the purpose of the flight was to get fuel at 08R. The Federal Aviation Administration inspector who examined the airplane before it was recovered did not observe any fuel in the compromised fuel tanks; nor was there any blighting of the grass or any other evidence of a fuel spill. The airplane was equipped with a Lycoming O-360, 180-horsepower engine, which was retained for further examination. Centennial-based Air Methods Corp., the nation’s largest air ambulance company, was hit last week with the sixth lawsuit since 2015 alleging that it overcharges patients. In a complaint filed Nov. 4, a Pennsylvania man injured in a car accident claims that publicly traded Air Methods Corp. billed him 400 percent more than what competitors would have charged for the same flight. And, he says, Air Methods has exploited thousands of patients like him. “Instead of charging patients a uniform, customary, and reasonable rate, Defendants charge outrageous prices that bear no reasonable relationship to the services rendered or what is customarily charged for the services,” said the complaint in U.S. district court, which also names a related company, Rocky Mountain Holdings, as a defendant. Air Methods Corp. lately has wrestled in court with patients who refuse to pay steep bills, even as the company’s revenue has surged 64 percent in five years, to $1.09 billion in 2015, according to its most recent annual report. Since April 2015, Air Methods has faced at least six putative class actions from patients, according to a tally of court cases mentioned in prior media reports and court records reviewed by BusinessDen. In a putative class action, a single plaintiff or group of plaintiffs claim to represent a class of people that has been injured and ask a judge to certify that status. In the lawsuit filed in Colorado last week, Air Methods allegedly billed the plaintiff, Jeremy Scarlett, nearly $47,000 for a 30-mile flight to a Pennsylvania hospital. Scarlett claims he was also asked to sign a document transferring his right to insurance payouts to Air Methods and compelling him to pay the difference out of pocket. Scarlett is being represented by attorneys Mitchell Baker in Denver, Jonathan Shub of Kohn Swift & Graf in Philadelphia, and Troy M. Frederick of Marcus & Mack in Indiana, Pennsylvania. Scarlett’s legal counsel did not respond to messages seeking comment. In another proposed class action filed in October, an Alabama woman received a $52,000 invoice from Air Methods after the operator transported her, unconscious, from the scene of a car accident. Her insurance reimbursed her for less than $9,500. Bills in the air ambulance industry have skyrocketed in recent years. The Colorado lawsuit claims that the average bill from Air Methods tripled from $13,198 in 2007 to $40,766 in 2014.